Residents may feel vulnerable either whilst at home or when out and about. A family member is home alone and hears an unexplained noise or has concerns about a potential loiterer. Whilst in a restaurant with family, friends or collegues, you may notice undesirables hanging round your vehicle. Driving home late at night you may feel you are being followed or notice a suspicious vehicle near your property. Owners and staff at licensed premises can feel exposed, especially at closing up time. Existing door supervisors may feel isolated and alone when they are on duty. Other staff can feel particularly vulnerable during hours when door supervisors are not on duty. The manager fears their house may be seen as an easier target to acquire the keys to the business safe. Staff members and keyholders of commercial properties face the risk of being targetted. A staff member notices an unexplained loiterer, causing them to fear for their safety or that of the business. Keyholding staff arriving early and leaving late are concerned by the risk of being targeted. Site workers can face a daily battle protecting their equipment from theives. Site workers have concerns as to thieves targeting them or their equipment. The unincentivised minimum wage night guard is ineffective yet costly; whilst being nothing more than a source of amusement to robbers and local children. Live deployment (20 men in a 10 mile radius) of the closest guards; ensuring the fastest response, by a myriad or relevant vehicles and manpower. Live notifications of physical venue checks straight to your mobile. Following a worldwide search for the latest and best technology, we have employed a system utilised by American emergency services. Including the latest release cars, 4x4’s to combat difficult terrain and rapid response motorbikes. 20 man response team within a 10 mile radius. Constantly developing new and innovative ways to keep our clients safe. 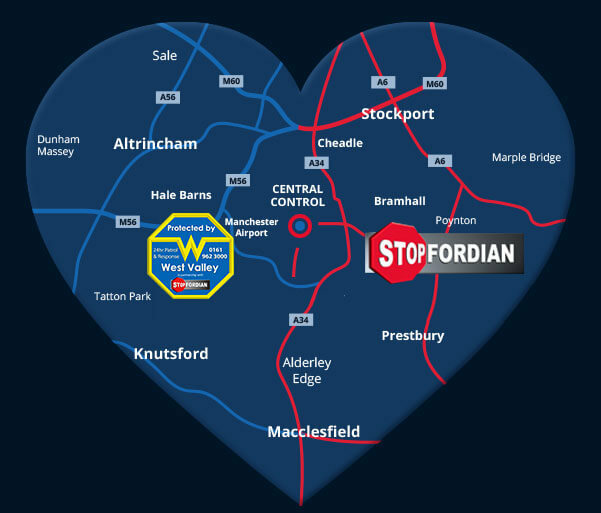 A charity across ‘The Heart of Cheshire’. Dedicated to forging links between Cheshire and all of its children. This charities running costs are funded by West Valley and Stopfordian; so that 100% of the donations go to the cause. Fill in the form below with your enquiry and a member of our team will get in touch. We will never share your email address with anyone or hassle you with unwanted emails.